Several studies have shown that adding more fruits and vegetables to your diet can drastically improve your physical and mental health and also assist in losing weight. Yet most people don’t consume even the minimum recommended servings. ‘Health.gov’ recommends eating 5 servings of fruits and vegetables combined, daily. This dietary requirement can be easily met by including fresh juices to your diet. While smoothies are generally rich in fiber, fresh juices help maximize the nutrients in every glass. It is no secret that fruits and vegetables are a rich source of vitamins, minerals and antioxidants which have a multitude of health benefits. Fresh cold pressed juice of fruits or vegetables, or a combination of both, is a great way to load up on all these nutrients. 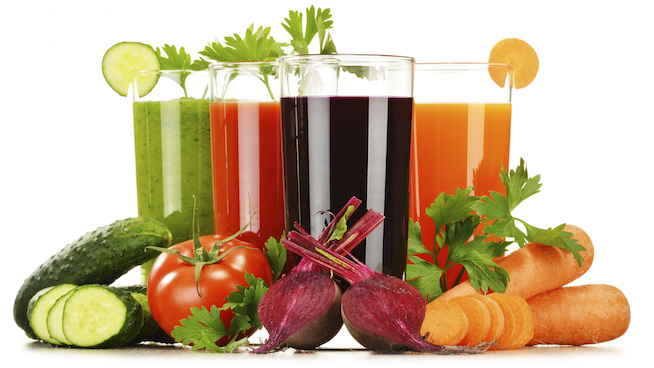 Investing in a good juicer that extracts the most nutrients from fruits and vegetables is key. So, if you’re ready to start juicing, and are excited about adding a juicer to your kitchen, read on! 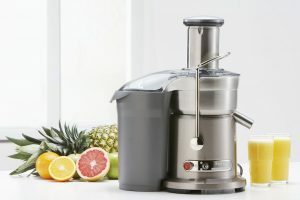 We review the top 5 juicers available in the market to help you buy the best juicer for your money. These juicers provide the fastest juicing speed. They use centrifugal force to separate the juice and the pulp, hence the name. A centrifugal juicer produces juice which is more pulp free as compared to masticating juicers. While these juicers are good for even the hardest of fruits and vegetables, they struggle with leafy vegetables like Kale or Spinach. The juice yield is pretty good, the high speed of operation exposes the nutrients to more heat and causes more oxidation of the juice (as a result the juice does not stay fresh for too long). Noise is a drawback of centrifugal juicers, but the quick juicing time makes up for it. If you intend to juice a lot of leafy vegetables like kale, spinach or cabbage, then a masticating juicer will serve you better. These cold press juicers also perform well with harder vegetables, but may under perform with softer fruits. Masticating juicers operate at much slower speed, but provide maximum juice extraction. These juicers also produce better quality of juice with less oxidation, so the juice lasts longer and can be cold stored for a couple of days. However, these types of juicers produce more pulpy juice, and getting pulp-free juice would require straining the juice. Though they are slower as compared to centrifugal juicers, they produce much less noise. Masticating juicers are also more versatile and can be used to make nut butter, baby food, smoothies and can also be used as grinders. Vertical masticating juicers are also available, which are vertical counterparts of the traditional horizontal masticating juicers. The vertical design makes them more compact. However, they are primarily designed for juicing and generally do not come with additional nozzles. 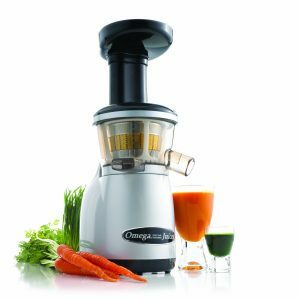 One of the top selling juicers, the Omega NC900 is a masticating juicer that gives good juice yield and quality, even with leafy vegetables like kale and spinach. Its slow juicing action (@ 80 RPM) reduces oxidation and protects nutrients from heat to give you fresh, natural tasting and healthy cold pressed juice. It is manufactured with durable BPA-free plastic, and comes with a 15 year warranty. The juicer provides hassle free juicing thanks to a wide feed chute that lets you put larger sizes of fruits and vegetables without having to slice them into smaller pieces. Omega has also added an adjustable end cap to maximize juice yield for harder and softer foods. Juicing softer food, however, can be a bit of a problem, but juicing soft fruits with harder fruits/veggies can help with that. In addition, it comes with 6 different nozzles that let you do more than just juicing. You can make all-natural nut butter, baby food, soy milk and a variety of health snacks. 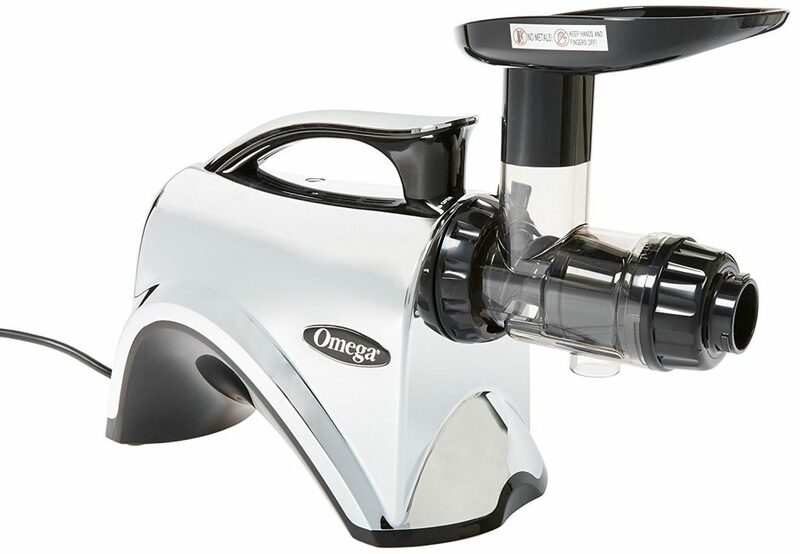 The Omega NC900HDC is certainly the best juicer for the money, both in terms of performance and reliability. And the 15 year warranty ensures that it serves you long enough so you get the best value for your money. The Breville 800JEXL is one of the best rated juicers and a perfect choice for quick juicing. It is a centrifugal juicer with a powerful 1000 watt motor which performs great even with hard produce like beets and carrots. However, the juice yield with leafy veggies like spinach and kale could be better. It has a wide feed chute which allows feeding whole fruits and vegetables, thus saving you the time and hassle of cutting them. This masterpiece from Breville ensures you get your juice fresh and quick, right when you crave it. The juicer is made up of stainless steel, and its parts are dishwasher safe. It is a durable and reliable machine that is definitely worth the investment. 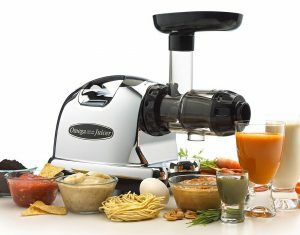 Another great juicer from Omega, the J8006 has all of the advantages of a masticating juicer. Its slow, deliberate cold press juicing action gives impressive juice yield, even with green leafy vegetables like kale, spinach and wheatgrass. While the juicer is slow compared to centrifugal juicers, it runs quietly and extracts high quality juice which can be stored up to 72 hours without going bad. However, the juice contains more pulp and a strainer would be required if you prefer pulp-free juice. Also, juicing soft produce tends to be problematic, but can be overcome by alternating hard and soft produce. The Omega J8006 has a smaller feed chute and fruits and vegetables need to be cut into smaller pieces to fit into it. As with the NC800, this juicer also comes with 6 different nozzles to make nut butters, baby food, soy milk, extrude pasta, grind coffee and spices, as well as mince herbs and garlic. It comes with a generous 15 year warranty so you are sure to get your money’s worth over the years. 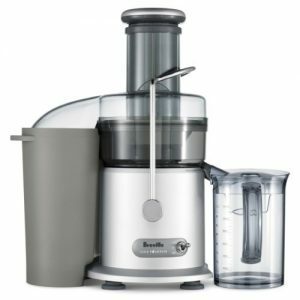 The Breville JE98XL, also featured in the movie ‘Fat, Sick and Nearly Dead’, is ideal for fast juicing, and its powerful 850 watt motor makes juicing hard and soft produce a breeze. It produces a good amount of juice, and does it pretty quickly. It comes with a wide feed chute which lets you drop whole fruits into it without the need to slice them into smaller pieces. It is easy to use and clean, with dishwasher safe parts. As with all centrifugal juicers, noise is on the higher side. Also, the juice contains a fair amount of foam, and juicing green leafy vegetables does not give great results. Compared to the stainless steel body of 800JEXL, the Breville JE98XL is made of plastic, but makes up for it in the price which is considerably lower. This one is great value for money. The VRT350 is an upright masticating juicer from Omega that has all the benefits of a cold press juicer in a space saving design. It has a slow cold press action which gives good juice yield with harder as well as softer fruits and vegetables. Though the juicing process is slower than centrifugal juicers, the juice retains maximum nutrition and can be stored for longer (up to 72 hours) due to less oxidation. The juice, however, contains quite a bit of pulp, which may be annoying for some. It has a noise free operation which is easy on the ears. Its auto clean feature makes cleaning it easier. The Omega VRT350 juicer comes with a 10 year warranty which, needless to say, is assurance of durability and reliability. Go ahead, get yourself one of these juicers today. Remember, it’s an investment in your health. Happy juicing!